Meter readings and energy-saving notes for dual fuel use at home in 2016. Annual supplier statements state that we are using/importing about 3 kWh electricity and 7 kWh gas on average each day for the year. 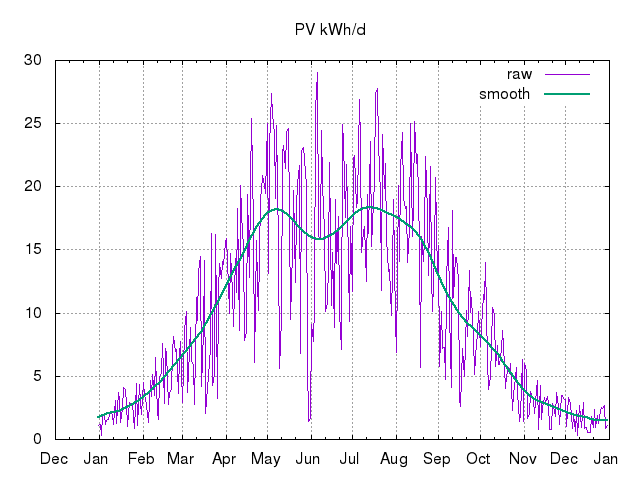 2016 data (kWh: e used 1831, e gen -3739, g 3851). 2016/01 196 (6.3/d) -71 (-2.3/d) 593 (19/d) 20151231-19:20-GMT to 20160131-17:48-GMT (31d) Meter readings: electricity generation 71.0kWh, export 45.3kWh, import 169.9kWh (thus net consumption (I+G-E) 195.6kWh); gas ~53.4m^3 (so 593kWh @ 11.1kWh/m^3). Generation on the first meter passed 21MWh. HDD12=173 vs 202 last January. 2016/02 160 (5.5/d) -141 (-4.9/d) 561 (19/d) 20160131-17:48-GMT to 20160229-10:09-GMT (29d) Meter readings: electricity generation 104.7kWh, export 104.9kWh, import 124.4kWh (thus net consumption (I+G-E) 160.2kWh); gas ~50.5m^3 (so 561kWh @ 11.1kWh/m^3). HDD12=172 vs 199 last February. 2016/03 180 (5.8/d) -274 (-8.8/d) 497 (16/d) 20160229-10:09-GMT to 20160331-17:35-GMT (31d) Meter readings: electricity generation 273.2kWh, export 220.7kWh, import 127.0kWh (thus net consumption (I+G-E) 179.5kWh); gas ~49.7m^3 (so 497kWh @ 11.1kWh/m^3). HDD12=162 vs 138 last March. 2016/04 143 (4.8/d) -455 (-15/d) 192 (6.4/d) 20160331-17:35-GMT to 20160430-17:15-GMT (30d) Meter readings: electricity generation 455.0kWh, export 392.8kWh, import 80.4kWh (thus net consumption (I+G-E) 142.6kWh); gas ~17.3m^3 (so 192kWh @ 11.1kWh/m^3). HDD12=104 vs 73 last April. 2016/05 147 (4.7/d) -756 (-19/d) 141 (4.6/d) 20160430-17:15-GMT to 20160531-17:41-GMT (31d) Meter readings: electricity generation 575.7kWh, export 497.5kWh, import 68.9kWh (thus net consumption (I+G-E) 147.1kWh); gas ~12.7m^3 (so 141kWh @ 11.1kWh/m^3). Passed 21MWh exports, and 22MWh+6MWh generation on the two meters. HDD12=23 vs 30 last May. 2016/06 132 (4.4/d) -474 (-16/d) 110 (3.7/d) 20160531-17:41-GMT to 20160630-16:27-GMT (30d) Meter readings: electricity generation 474.2kWh, export 404.4kWh, import 62.3kWh (thus net consumption (I+G-E) 132.1kWh); gas ~9.9m^3 (so 110kWh @ 11.1kWh/m^3). Annual supplier statements state that we are using/importing ~3kWh/d electricity and ~7kWh/d gas on average for the year. HDD12=2 vs 7 last June and 2 the previous June. 957 (5.3/d) -1990 (-11/d) 2093 (12/d) 20151231-19:20-GMT to 20160630-16:27-GMT (182d) Implies total footprint to date -46kgCO2: electricity (average 219W gross) -444kgCO2e @ 0.43kgCO2/kWh (netted), gas 398kgCO2e @ 0.19kgCO2/kWh. 2016/07 135 (4.4/d) -585 (-19/d) 126 (4.0/d) 20160630-16:27-GMT to 20160731-17:45-GMT (31d) Meter readings: electricity generation 585.0kWh, export 510.6kWh, import 60.9kWh (thus net consumption (I+G-E) 135.3kWh); gas ~11.3m^3 (so 126kWh @ 11.1kWh/m^3). HDD12=0 vs 1 last July and 0 the previous July. 2016/08 102 (3.0/d) -563 (-17/d) 75 (2.2/d) 20160731-17:45-GMT to 20160903-17:46-GMT (34d) Meter readings: electricity generation 563.0kWh, export 508.8kWh, import 48.1kWh (thus net consumption (I+G-E) 102.3kWh); gas ~6.8m^3 (so 75kWh @ 11.1kWh/m^3). 'Long' month since away on holiday a few days into September. Zero gas use and HDD while away. Electricity use ~1.3kWh/d while away, 50% covered by generation. Latest Ecotricity projections for our annual imports: e ~1300kWh, g ~3300kWh. HDD12=0 (calendar month) vs 0 last August and 5 the previous August. 2016/09 132 (4.9/d) -254 (-9.4/d) 103 (3.8/d) 20160903-17:46-GMT to 20160930-16:43-GMT (27d) Meter readings: electricity generation 254.4kWh, export 210.4kWh, import 87.9kWh (thus net consumption (I+G-E) 131.9kWh); gas ~9.3m^3 (so 103kWh @ 11.1kWh/m^3). 'Short' month since away on holiday a few days into September. The load supposedly moved off-grid (~0.3kWh/d) does not seem to have reduced the gross consumption figure. HDD12=2 (calendar month) vs 14 last September and 5 the previous one. 2016/10 146 (4.7/d) -205 (-6.6/d) 201 (6.5/d) 20160930-16:43-GMT to 20161031-17:12-GMT (31d) Meter readings: electricity generation 204.7kWh, export 164.3kWh, import 105.8kWh (thus net consumption (I+G-E) 146.2kWh); gas ~18.1m^3 (so 201kWh @ 11.1kWh/m^3). Large tree to SE hard-pruned 2016/10/04 and may reduce 0800Z--1000Z grid-tie generation dip from shading (see after) this month and in spring. Gas consumption higher than last year as OpenTRV on test this month. HDD12=38 vs 32 last October and 15 the previous one. 2016/11 179 (6.0/d) -88 (-2.9/d) 599 (20/d) 20161031-17:12-GMT to 20161130-18:12-GMT (30d) Meter readings: electricity generation 88.4kWh, export 58.8kWh, import 149.1kWh (thus net consumption (I+G-E) 178.7kWh); gas ~54.0m^3 (so 599kWh @ 11.1kWh/m^3). Lots of messing around with OpenTRV algorithms seems to have increased electricity and gas consumption over and above very cold month. HDD12=154 vs 63 last November and 79 the previous one. 2016/12 180 (5.8/d) -88 (-1.7/d) 653 (21/d) 20161130-18:12-GMT to 20161231-18:29-GMT (31d) Meter readings: electricity generation 53.9kWh, export 32.0kWh, import 157.6kWh (thus net consumption (I+G-E) 179.5kWh); gas ~58.8m^3 (so 653kWh @ 11.1kWh/m^3). HDD12=160 vs 38 last December and 183 the previous one. 1831 (5.00/d) -3739 (-10.2/d) 3851 (10.5/d) 20151231-19:20-GMT to 20161130-18:12-GMT (366d) Gas usage up due to cold winter. Not clear why electricity use up again. Note that grid electricity carbon intensity dropped significantly again in 2016, which would reduce the benefit of our electricity exports, but previous (0.43kgCO2/kWh) figures will be used for comparison. 787kg (2.2/d) -1608kg (-4.4/d) 732kg (2.0/d) ~-0.09tCO2 (~-0.24kgCO2/d) gas/electricity emissions total for 4 people, based on 0.43kgCO2/kWh for electricity (netted) and 0.19kgCO2/kWh for gas, ie slightly carbon negative. Page Media: video player raw video(0MB, 4.238s ) image, alternate, alternate. First published 2016-01-01 , updated 2019-04-22 . Site copyright © 2007-2019 Damon Hart-Davis. Hosted by ExNet.